It’s something that you never talk about as a visitor to Bolivia – well almost never: Bolivia’s access to the sea. If you do, it stirs up hot feelings about at a topic that has been around for 125 years! In fact, there is (or at least, was) a railway line that ran from La Paz down into Chile – the train running on it being an old S-Bahn carriage from Munich. One of the easiest ways to think about the situation is to compare it with the connections between West Germany and West Berlin during the Cold War – they were there, but the West did not like being restricted by their neighbour and the East resented having to provide the access in the first place. Chile allows Bolivia access to the sea, but on its terms. 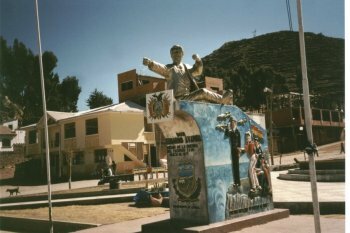 Bolivia resents this, but does not really have much choice. Take a look at the Bolivia coat of arms and you can count ten stars on it – one for each province in the country. Except that Bolivia only has nine provinces – the tenth is the one that was annexed by Chile and remains on the coat of arms to show that Bolivia still makes a claim to this area. So imagine my surprise this week when I read that Chile wants to give Bolivia better access to the port, such as being able to import goods without them being checked by Chilean customs. I wonder how Bolivia will react? More of a grateful “thank you” or will it be a case of “thanks, but we’ll like our land back and not just access to it”? You are currently browsing the Amigos de Sucre blog archives for June, 2008.